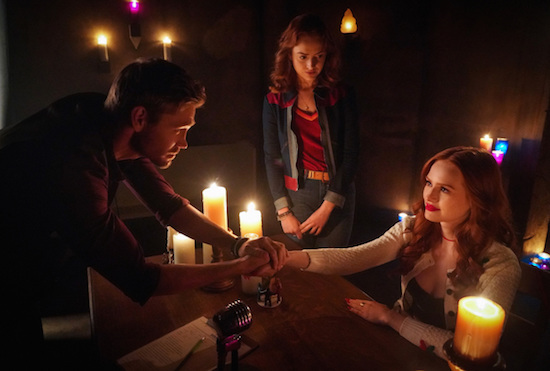 It’s Edgar Evernever (Chad Michael Murray) versus Cheryl (Madelaine Petsch) on the Wednesday, March 27 episode of RIVERDALE. Riverdale -- "Chapter Fifty-Two: The Raid" -- Image Number: RVD317b_0125.jpg -- Pictured (L-R): Chad Michael Murray as Edgar Evernever, Zoe De Grande Maison as Evelyn Evernever and Madelaine Petsch as Cheryl -- Photo: Shane Harvey/The CW -- ÃÂ© 2019 The CW Network, LLC. All rights reserved.